Cat's Cradle is now closed. Cats Cradle is now closed and Michele has retired to Boston, MA. Thanks for allowing us to care for your kitties for the last 12 years. Michele can still be reached at micheled@catzcradle.com. We wish the best to all of you. Where ever you go, Cat’s Cradle is the place for you kitty’s vacation! Our porch rooms provide your cat with unlimited sights and sounds as they lounge on their stainless-steel screen-enclosed, raised veranda surrounded by fresh air and sunshine. The porch rooms are always the first to go so get your reservation in soon! Don't Leave Your Cat HOME ALONE! The next time you need to leave town, whether for vacation or business, don't leave your cat home alone! 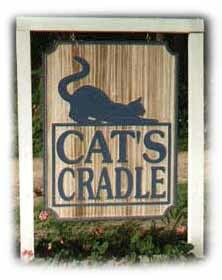 Cats Cradle Fine Feline Accommodations is a cats-only boarding facility that specializes in personalized care for your cat. 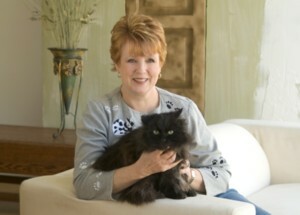 On-sight owner/operator, Michele Dunckel, has over 40 years of experience providing love and attention to cats of all shapes and sizes. Michele's knowledge and compassion will make your cat's visit a relaxing, healthy vacation while giving you the peace of mind you won't get from a kennel. "...is two-fold: first, making your pet as comfortable as possible while you're away. This includes lots of attention and affection, exercise, a healthy diet and safety in a non-threatening environment. In doing so, I accomplish the second part of my objective: allowing you the peace of mind to travel knowing your cat is well cared for and content in your absence."